Have you ever considered that as a landlord you might be offering too many amenities and facilities at your rental property than necessary? As per the acceptable and implied laws of habitability, the landlord must provide his/her tenants safe and habitable accommodations that offer continuous supply of heat, electricity, gas and water along with a sound method of disposing of garbage. Amenities that you offer apart from these mandatory ones are a bonus for your tenants. It is true that addition of necessary appliances for your rental property like refrigerator or cooking range make the property more attractive to tenants but there are some items that can and do create liability issues and maintenance problems. The following list will introduce you to those must-not have appliances and amenities at your rental unit. On average dishwashers are counted among those appliances that require extreme care and don’t generally last long. Although these are useful appliances to have at your rental property, let’s admit that many people can easily do without one. Avoiding installation of a dishwasher will help save water, electricity and of course, money. Moreover, you will be able to prevent laborious maintenance and repair issues while the extra storage space would be helpful for the tenants. Trash compactors are not as durable and long-lasting with an average life of around 6 years. The primary reason behind installation of trash compactors is to convert several bags of trash into one, heavy bag. However, the trash it can handle does not include glass, metal and plastic and since it is emptied infrequently therefore, there is every possibility that food scraps become smelly and attract ants and insects. It is better to avoid trash compactors as appliances for your rental property and use the space for more practically viable things. Ice makers offer a rather convenient way to make ice without having to constantly fill up the ice trays. However, when the refrigerator is moved from one location to another, it is possible to break the water connection resulting in unnecessary trouble due to water leakage. If you are willing to provide a refrigerator with ice maker, leave it disconnected to avoid issues later. We suggest that you provide a refrigerator without an ice maker. Installing swing sets on the yard definitely helps in attracting tenants with kids but from a safety perspective, we suggest that you leave them out and let the kids enjoy the swings at the nearby park. You should be concerned about injuries that can be caused when kids become reckless with swings. Moreover, having swings around would make maintenance of the lawn or garden quite a difficult and time-consuming task. Don’t install swinging chairs anywhere around the porch either. The main advantage of having carpeted property is that it muffles noise and makes the room cozier by adding insulation. However, the drawbacks of carpeting outweigh its advantages. You must not ignore the fact that mold frequently grows in carpets especially rugs and spills usually create permanent stains, which ruin the appearance of the carpet. The color is also faded due to sunlight if there are large windows in the room. Therefore, we recommend that you choose hardwood or laminate flooring. You might need to refill inflatable pools quite often otherwise they will become unhygienic. This is not an easy task at all since you would need around 800 gallons of water if the pool is 6-by-6 foot and 3 feet deep. This much water would be enough to run an entire household for ten days. Maintenance of inflatable pool is quite expensive considering that the pool pump consumes a lot of energy and if the pool is poorly maintained, it will quickly become unsanitary creating health issues at your unit. This would result in earning a visit from local health department. Lastly, pools are very dangerous if there are small kids living at the property and many prospective tenants would avoid renting your property due to that. As a landlord of course you want to make your rental property as attractive as possible to prospective tenants. 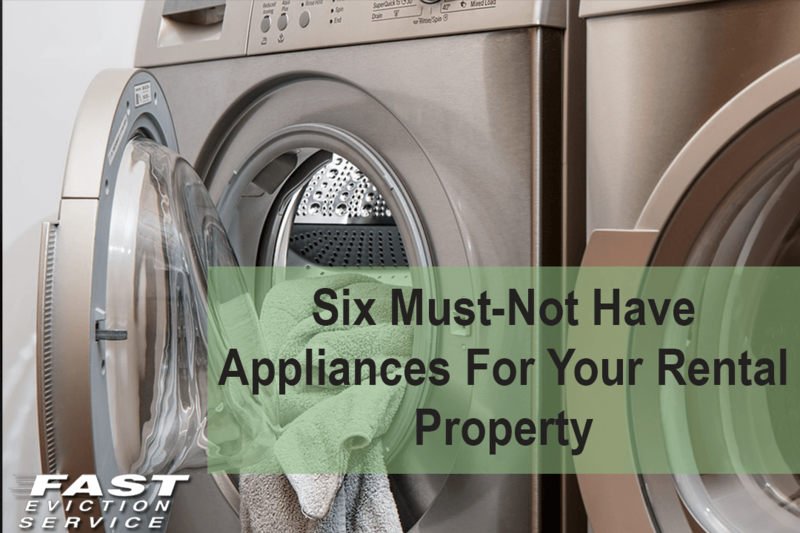 However, keep in mind certain appliances for your rental property could be more trouble than they are worth and avoid the appliances on this list to save yourself future problems.